We really don’t need another reason to eat butternut squash other than it’s creamy, buttery texture and comforting goodness. However, we can happily add to the list with the abundance of nutritional benefits and vitamins and minerals butternut squash has to offer. Health Benefits: Butternut squash is naturally low in fat and contains high amounts of folate and fiber- a great heart healthy food! 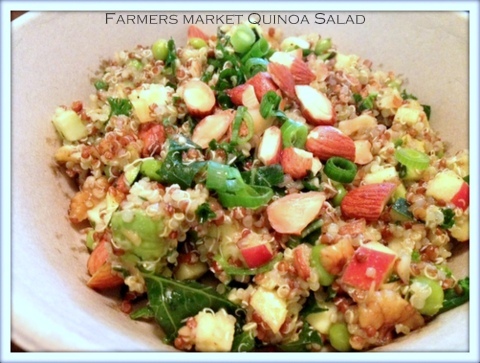 (The fiber helping to you feel fuller longer and aid in digestion as well). It contains Vitamin B6, which is essential for a properly functioning nervous and immune system. 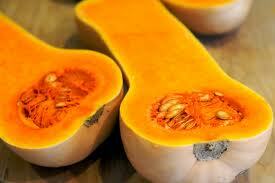 Butternut squash is high in potassium, which helps to regulate water retention and also improves bone health. The most noteworthy benefit is obvious in its deep orange coloring. This rich color signifies the ample amount of nutrients called carotenoids, which are big protectors against heart disease and promote eye health. It is also high in Vitamin C- helping to keep that immune system in top shape. Just one cup has 1/3 the daily dietary needs of Vitamin C. Its high antioxidant count contributes to its anti-cancer properties as well as helping to maintain that youthful glow we all strive for. Last but not least is its anti-inflammatory benefits. Many of us have inflammation in the body that manifests in different ways. Some of the obvious are joint pain, rheumatoid arthritis, asthma, and many other -itis diagnosis. We all could use anti-inflammatory foods to help balance and protect against those that cause inflammation from packaged and processed foods. How to chose: Look for those free of bruises and blemishes as well as one with a matte finish as well as shiny (not ripe enough). Check to feel the weight and aim to buy one that is heavy for it’s size. Store in a cool dry place, do not refrigerate. How to prepare: There are numerous ways to prepare butternut squash. You can cut the squash in half length wise using a large chef knife. Scrape out the seeds, lay flesh side up on a baking sheet or pan. You can fill with 1/4-1/2 inch water to prevent from burning the bottom. Brush with coconut oil, butter or another high heat oil, and sprinkle with sea salt and your favorite spices. I bake mine on 400 for about 45-1 hr, or until soft when pierced with a fork. You can cut width-wise and carefully remove skin with a sharp chef knife (be careful!) Cut into cubes and roast, steam, or saute. You can also cut into round rings and then again into half moons, baking on high heat. Another option is to pierce the squash whole with a knife, and bake until soft, about an hour. Cut in half and scrape out skin, removing seeds. Check back soon for my Roasted Butternut Squash with Sage + Apple soup recipe I have been selling like crazy at The Galley. Day 4… did somebody say chocolate? Yum. Today’s smoothie is packed with a ton of health benefits and anti-oxidants from the mix of berries and raw cacao powder. Cranberries are highlighted in this smoothie, not only are they in season and deliciously tart, they contain loads of detoxifying properties! Cranberries – they contain one of the highest count of antioxidants of all berries. They also contain high amounts of fiber and phytonutrients. These phytonutrients give cranberries their antioxidant, anti-inflammatory, and anti-cancer properties, In fact, cranberries have been shown to provide crucial anti-inflammatory benefits for the cardiovascular system and for many parts of the digestive tract (including the mouth and gums, stomach, and colon). Cranberries help to balance out the good and bad bacteria in our stomach and are proven to reduce the risk of urinary track infections (because they contain proanthocyanidins (PACs), which fight certain ‘bad’ bacteria, including E.coli). They help to keep the kidney functioning well and flush out unwanted waste and bacteria. Raw Cacao Powder – (another superfood!) is high in magnesium and iron content, and contains other essential minerals such as calcium, sulfur, zinc, copper, potassium, and manganese. It is loaded with antioxidants, protecting and neutralizing against free radicals and contains heart-healthy fat oleic acid, a monounsaturated fat. Cacao improves digestion, stimulating the body’s production of digestive enzymes, helping with elimination (essential for a detox). Certain components of cacao powder help to stimulate the central nervous system and dilate blood vessels, causing you to experience elevated energy boosts. Also, certain chemicals, referred to as “bliss” chemicals, improve circulation, increasing the amount of serotonin and other neurotransmitters in the brain, which helps to improve mood and fight depression. Berries – in general berries contain the highest amount of antioxidants of fruits. Specifically blueberries and cranberries. They contain anti-viral, anti-inflammatory, and anti-bacterial properties, as well cancer fighting components. They also contain high amounts of Vitamin C and fiber, which as we know is great for eliminating during a detox. The high fiber and other components of berries help cardiovascular health and decrease the LDL levels of cholesterol. You can find the health benefits of apples and avocados from our Day 1 smoothie recipe this week. 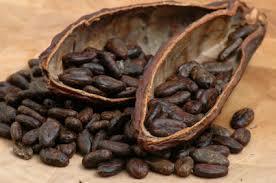 Who knew raw cacao and the taste of chocolaty goodness had so many amazing health benefits. Add it to smoothies and desserts for the added health benefits and decadent taste. Day 3 + half way through our detox! This smoothie has all sorts of goodness in it. Get ready to wake up your tastebuds, body, and mind with its refreshing and invigorating ingredients. Mango is rich in vitamins, minerals, pre-biotic dietary fiber, and antioxidants. 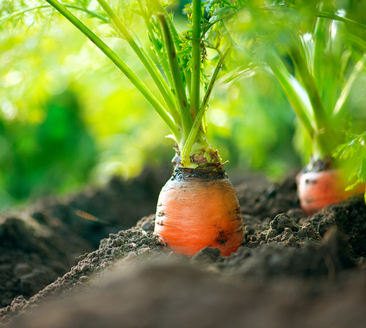 It is an excellent source of Vitamin-A and flavonoids beta-carotene, alpha-carotene,and beta-cryptoxanthin. It is high in Vitamin C, which helps neutralize harmful oxygen-free radicals and contains potassium which is essential in maintaining healthy blood pressure and fluid balance. Compared to most fruits, mango is fairly low on the glycemic index chart (41-60), so enjoying mango occasionally will not spike your blood sugar levels. Aloe Vera is an incredible plant that has many health benefits and medicinal uses. It contains loads of health benefits and components such as vitamins, minerals, amino acids, enzymes, polysaccharide, and fatty acids. Some vitamins include, folic acid, choline, Vitamins A, C + E, B vitamins, including B12 which is rarely found in plants. Minerals include calcium, magnesium, as well as selenium, sodium, iron, potassium, copper, and manganese. Aloe vera also contains all 8 essential amino acids, as well as fatty acids which help lower fat in the blood cells and help reduce allergy symptoms as well as acid indigestion. Aside from all of the vitamins and minerals aloe vera juice is extremely beneficial in the detoxification process. It also helps to soothe the digestion track, and regulates the digestive system. Because aloe vera is a gelatinous plant, when digested, the gel moves through the intestines and absorbs any toxins and unwanted waste, helping to eliminate and flush out of the body. Aloe vera is alkalizing, which helps balance the pH in your body, as well as an anti-inflammatory and immune booster. Flax seeds – these tiny little seeds are nutritional power houses. First, they are a great source of fiber, helping to regulate digestion and aid in the detoxification process. Flax is a great plant source of the essential fatty acid, Omega 3. Theses little seeds also contain potassium for a healthy heart and muscles, as well as iron and zinc to boost your immunity. They contain trace minerals such as riboflavin and niacin, thiamin, and B vitamins (all which help to turn food into energy). They must be ground in order to gain all of the benefits they have to offer. When consumed whole they pass right through and are not digested fully. 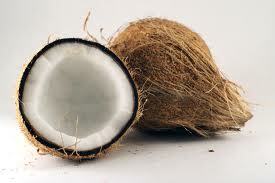 Coconut oil is an amazing superfood filled with so many health benefits and nutrients. Coconut oil contains antioxidants, helps to absorb nutrients and vitamins, has antimicrobial, antibacterial, and antifungal properties. It is made up of mostly Medium Chain Fatty Acids (MCFAs), which unlike Long Chain Fatty Acids, are sent straight to the liver for energy production. It kills candida growth, corrects many skin conditions, helps with hypothyroidism, and helps speed metabolism. Spirulina is on my list as one of the top superfoods. It is a micro-alga (you can’t taste it inthe smoothie, I promise!) that has a high concentrate of protein, specifically made of essential amino acids. It is also has a high content of calcium, vitamins, nutrients and trace minerals, as well as iron and beta-carotene. 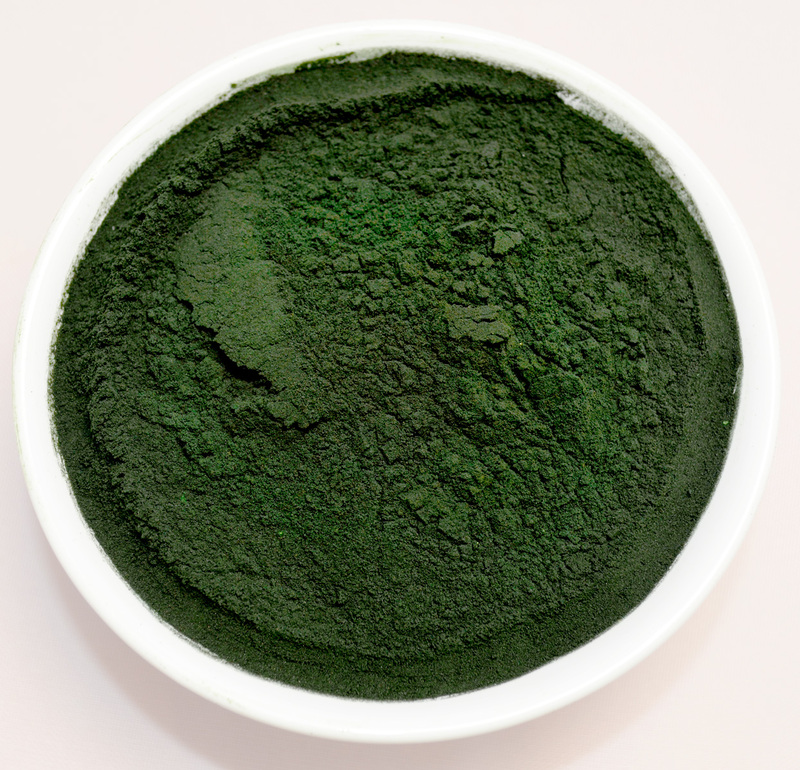 Spirulina stimulates and boosts the immune system and detoxifies the body of pollutants and heavy metals.It is high in Chlorophyll, which purifies the blood, removing toxins from your system. It has anti-inflammatory properties, may lower cholesterol, and even fight off allergies due to its histamine blocking effects. 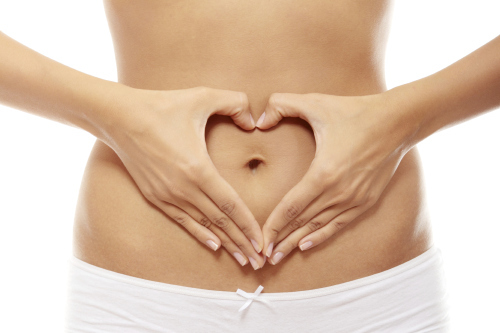 Spirulina also helps produce healthy stomach flora and promote digestion. Blueberries are full of anti-oxidants such as vitamin C, B complex,vitamin E, vitamin A, Anthocyanin, copper, selenium, zinc, and iron. Blueberries help to build the immune system and repair free radicals caused by oxidative stress (helping to combat the effects of aging) These tiny berries contain high amounts of fiber, which promote a healthy heart by lowering LDL or ‘bad’ levels of cholesterol. Spinach- so many reasons to love this dark leafy green! It has anti-cancer and anti-inflammatory components and helps fight against cardiovascular problems. Spinach is loaded with Vitamin K, calcium and magnesium-all which help promote strong bones. It is also loaded with Vitamin C + A and Iron, zinc, phosphorus, potassium, copper, and omega-3 fatty acids and B vitamins. among others. It is great for your skin as well, fighting acne and giving you that natural glow we all want. The high count of lutein in spinach helps to keep your eyes healthy and clear. The added purified water in the smoothie helps to hydrate your body while flushing out the toxins that are being lifted from cells and tissues. Make sure to continue drinking lots of water throughout the day. Its benefits are maximized when drank at room temperature, with fresh juice from half of a lemon. Remember to embrace the mindfulness and awareness you are practicing while making healthy choices this week. Make sure to be good to your body and give it credit for being the tool that which allows us to move through life. Our bodies are so resilient that even through times when we aren’t so good to it, we are able to restore and rebuild within by nourishing ourselves with all of these nutrient- dense foods. Yay for the start of our detox! It is the beginning of a week of cleansing and rejuvenation. I hope everyone had a great weekend and is feeling as excited and ready for the detox as I am. If you are just learning about the detox, it’s not too late to sign up or join me, using my smoothie recipes I will be posting this week. Read here for more details about the cleanse and some basic guidelines on what foods are included and what to avoid. I started to ease myself into our cleanse last week and began my detox Saturday. I also did a meditation course on Saturday that was amazing, helping me to mentally prepare. I really enjoy meditation and try to incorporate it in my daily life. Meditation helps me feel grounded, reminds me to practice mindfulness + compassion, and helps to put things in perspective. It is also a great way to take a few minutes out of our stressful and busy routine, to breathe, reflect and look deeper into our inner selves. If anyone is interested in meditation in the Philadelphia area I highly recommend going to the Shambhala Meditation Center. The mediation instructors (in my humble opinion) are the best in the area. Back to the detox. I am already feeling my energy levels rise and my mood more positive and stable. I rarely feel THIS good on a Monday.. and I don’t think it’s a coincidence. 😉 Aren’t you excited to start feeling great? Our smoothie this morning is packed with so many great ingredients and some of my favorite foods. 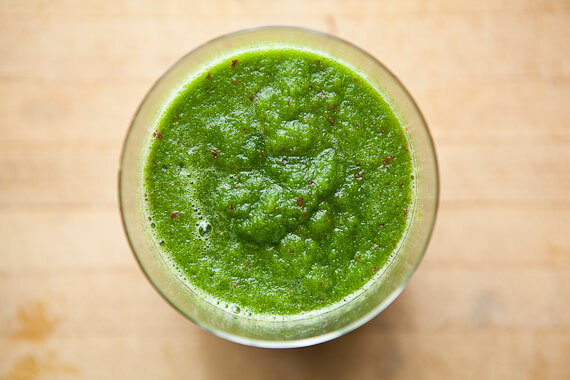 It is extremely refreshing from the cucumber and mint, and is loaded with kale and spinach. The only bit of sweetness comes from half of a green apple, which contains many detoxifying properties itself. I added hemp protein powder, which I love because hemp seeds naturally contain 21 known amino acids, including the 9 essential amino acids. This makes hemp a complete protein. It also contains the proper 3:1 ratio of Omega 3 and Omega 6. Hemp protein is more easily digested because of the globular proteins it contains. Globular proteins dissolve faster and are thus more readily used. Hemp protein is a great source of plant protein, providing a large dose of healthy fats and protein. It also happens to be one of the most earth friendly proteins. Because it grows tall and extremely fast- being naturally invasive to all weeds that may grow around the crop- the use of herbicides or pesticides is not necessary. My favorite brand is Manitoba Harvest. It dissolves great in smoothies and doesn’t seem to leave a chalky after taste. I recommend making this smoothie on a daily basis. It will give you more energy than any cup of coffee, not to mention providing many nutrients and vitamins your body needs. It is great for healthy skin, digestion, hydration, and obviously works wonders in the cleansing process. Enjoy! Apples aid in blood sugar regulation (nixing sugar cravings), contain loads of antioxidants, vitamins and fiber. They help to slow down carbohydrate and glucose absorption, lessening the sugar load on our blood stream. Kale provides one of the most powerful antioxidant and detox properties than any other leafy green. When digested, kale forms a substance called sulforaphane, which causes the liver to produce enzymes that actually flush out harmful chemicals that cause cancer. Kale is high in fiber, Vitamin A, C and E, iron, and calcium. Cucumber has many detoxifying, antioxidant, and anti-inflammatory properties. It is high in fiber, Vitamin A and K, hydrating, improves digestion, helps to eliminate constipation and reduces the risk of colon, breast and ovarian cancer. Avocados are high in heart healthy fat Omega 3s. Fat is important during detoxification as it promotes the release of bile from the gallbladder, aiding in the elimination of toxins from the body and the absorption of fat-soluble vitamins. Avocados contain a healthy dose of potassium, folate, Vitamin E + B5 and fiber. Lemons are a powerful detoxification aid. They are alkaline forming, helping to balance the pH balance in the body. The citric acid allows the breakdown of bile and dissolves any other toxins in the body, also helps flush out the kidneys and colon of toxic build up. Lemons also contain Vitamin C, which helps to neutralize free radicals and boost the immune system. Mint is a natural stimulant, which helps with digestion and soothing the digestive track. It also stimulates the digestive enzymes that absorb nutrients from food and consume fat and convert it into energy. Therefore, it is helping you convert the food you consume to energy rather than storing it as fat. 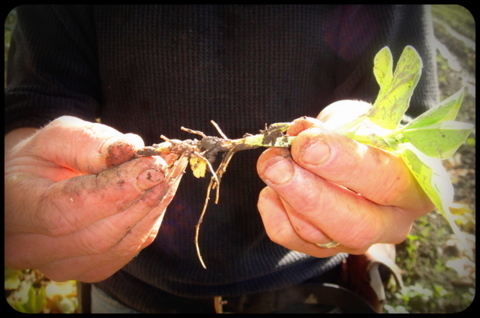 As a natural stimulant, mint is known to naturally combat fatigue and help to recharge your batteries. Great for a Monday morning boost! We’re getting close to The Galley Cafe opening date at Vincera Institute in the The Navy Yard! So excited to place my first produce order with Lancaster Farm Fresh… locally rooted, sustainably minded. What is not to love about organic, local and seasonal produce delivered daily? It’s important to support local and be as active as you can in the sustainable food movement! Foods that are grown with chemicals and pesticides adversely affect your health, causing toxin build up, hormonal imbalance, brain and nerve cell damage, cancer, and infertility. Not to mention organic fruits and veggies taste better and are found to have a higher content of vitamins and minerals than those filled with harmful pesticides and/or genetically modified. So eat up the good stuff and join your local CSA today or check out farmers markets and natural health stores in your area. To get information on your local CSA, farmers markets, or sustainably grown food in your area click here. Check back for updates and cafe opening date details!